90’s psych-grunge trailblazers Soundgarden just announced three intimate North American shows in support of their forthcoming studio album, King Animal. The run will kick off with a show in New York City at Irving Plaza on November 13, before a stop in Toronto at The Phoenix on November 16, and wrapping up at The Fonda Theatre in Los Angeles on November 27. 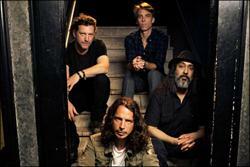 King Animal is Soundgarden’s first new album in over 15 years and will be released on November 13, 2012. Fans who pre-order King Animal before 11:59pm PST on November 7 (click here to order) will be sent a password which allows access to the on-sale on November 8 at 12pm Local Time for the shows at Irving Plaza in New York, The Phoenix in Toronto and The Fonda Theatre in Los Angeles. Tickets will be sold on a first come first served basis, and there is no guarantee a password will get you tickets. Additionally, there will be a public on-sale that will begin at 10am Local Time on Friday, November 9. For fans that cannot be in New York City, Toronto or Los Angeles, Soundgarden will be performing a Live On Letterman live webcast concert on Monday, November 12, available on CBS.com and VEVO, before their appearance on the Late Night with David Letterman that same evening on the CBS Television Network. The band will also be performing on ABC’s Jimmy Kimmel Live! on November 26 at 11:35 PM ET/8:35 PM PT.